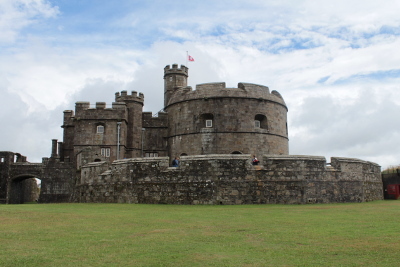 We visited Pendennis Castle whilst staying at John Fowler's in St Ives. It was a wet day and whilst castles don't normally come on the top of the list for rainy days it looked as though Pendennis castle had a reasonable amount of buildings that could keep us dry. This turned out to be correct as whilst there is walking outside between the buildings much of the time was spent indoors. Pendennis Castle is a bit different from some castles as whilst the castle originates from the reign of Henry VIII it has continued to serve as a military post up until after the second world war. As such it is as much about the second world war as it is about the medieval origins. For me this was particularly interesting as whilst I find the medieval castles interesting I am more interested in more recent history. There is lots to see and do inside the castle, mostly related to the second world war, but the keep has a display with life sized models and number of boards about it's original use. There is also a selection of cannons and gun batteries covering both eras and all the time in between. 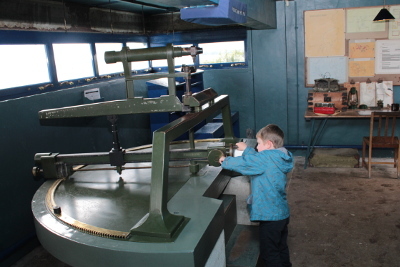 As well as the gun batteries there is a building showing some of the science behind the guns and other technology used for defence. There is also a collection of wartime cartoons by George Butterworth which were featured in papers during the second world war. 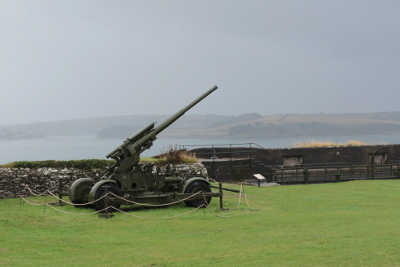 There is lots to see and do at Pendennis castle, particular for those interested in the 1st and 2nd world wars. There are some great views of Falmouth bay from the castle. There is plenty to do whatever the weather, although an umbrella does come in handy for getting around the castle.